You guys, I made a vegan cake. Did you read that? I said vegan. Not only is it vegan, I’m considering it healthy enough for breakfast. I think that’s a plus. And until I had some really amazing salmon last weekend, I was tossing the idea of becoming vegan. Because if I can have cake like this, I have no issue giving up animal products. I think I told you that I have recently discovered the amazingness of chia seeds. They make an appearance in this cake. As does brown sugar (one of my favorite flavors ever) and apple sauce and whole-wheat flour and bananas. This cake is moist beyond moist. It’s nutty and just slightly sweet and convinces me that vegan baking is something to continue to explore. What do you think? 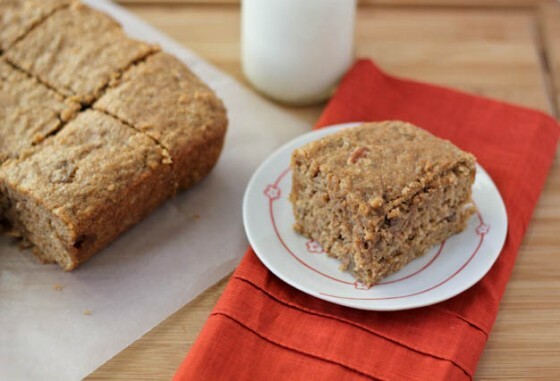 Have you tried baking with vegan products and/or without animal products? 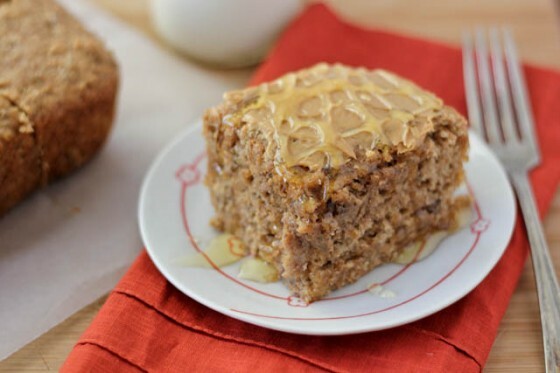 All the flavors of banana nut bread mixed into a healthy whole-wheat breakfast cake featuring chia seeds for added nutrition. Preheat oven to 325. Liberally spray an 8x8 baking dish. Set aside. Combine the chia seeds and warm water in a small bowl and set aside. The mixture will gel and will be used in place of eggs in the batter. In a small bowl, whisk flour, baking powder, cinnamon and salt together until combined. Fold in the pecans and pour into prepared pan. Bake for 40-50 minutes until a toothpick inserted comes out cleanly. Serve warm or at room temperature. If you prefer to make this not vegan, you can replace the chia/egg mixture with 2 eggs and replace the applesauce with the same amount of melted butter. 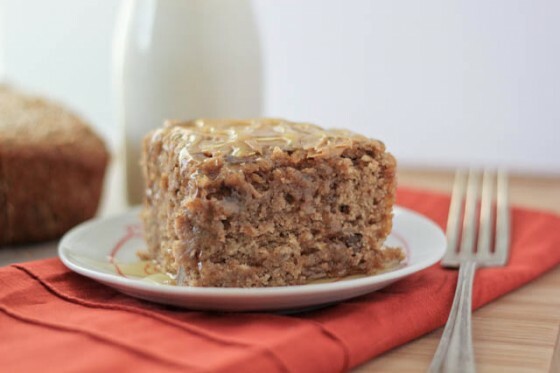 Other substitutions: sub all-purpose flour for whole-wheat; omit pecans altogether or replace with walnuts or almonds; use canola instead of grapeseed. I served the cake with peanut butter and honey. It would also be wonderful with Biscoff spread, fresh bananas and yogurt. Okay, now that’s my kind of breakfast! Delicious, Cassie! I love vegan options, especially since I contemplate going vegan all the time. This looks REALLY good, Cassie!!! Um, k. I’ve never made a vegan recipe, but I am all over this! Looks amazing and would make my coffee very happy right now! 🙂 Have a super start to your weekend!!!! I like any kind of cake with “breakfast” before it. I made vegan stuffed tomatoes the other day and thought they were delicious. And then I ate them alongside a steak. So, yeah I don’t think I could do the vegan thing exclusively but I don’t mind eating that way occasionally. I’ve become obsessed with chia seeds over the last 2 years. they find their way into everything. Loving the look of this cake! I am so excited about this. I remember seeing it on Instagram and just about dying. Yummm! This looks so delicious and moist, Cassie! Lovely photos, too. Thanks for sharing your recipe. Have a great weekend! 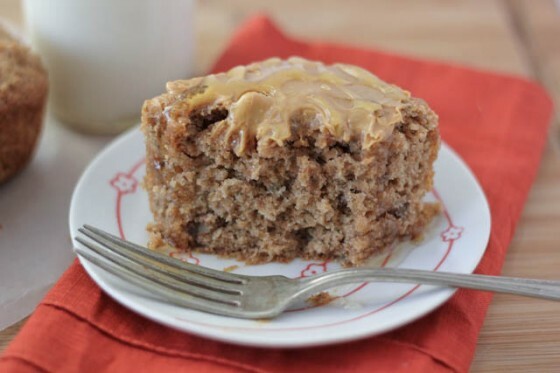 I just love this breakfast cake! I am definitely going to make it this weekend. I just got to get my hands on some chia seeds. My twins (and I) would love this! You are cooking up fabulous recipes! I’ve made a few vegan desserts- and you know I don’t always even notice! This cake looks like a perfect breakfast- I want some right now please! I’m going to do some vegan baking this weekend for a friend, I’m intrigued to see how it turns out! This cake looks absolutely delicious. This would make me very happy at breakfast time! This sounds delicious – I would love to have a few pieces…or the whole thing! ^^ I enjoy baking with chia seeds because they can replace so much fat and keep you full…practically all of my baked goods are filled with them. The plus with this is that I’m vegan and I’ve found it very easy to make recipes without the eggs and milks, ect. I just started using chia seeds as an egg replacer. My boys’ are allergic to eggs and I am loving these wonderful little seeds! We’ve also been tossing some on our oatmeal and into our smoothies! Vegan or not, any cake I can eat for breakfast is my new BFF! Any cake that I can eat for breakfast is a total winner for me! Especially when it involves bananas! 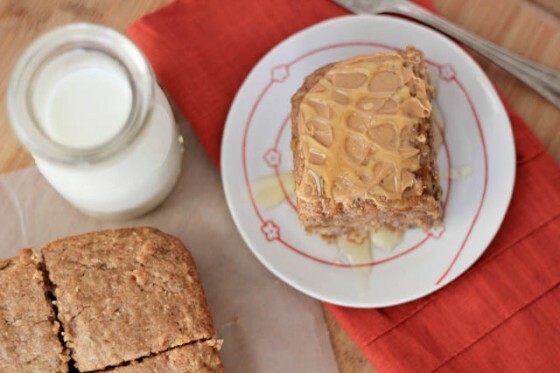 I haven’t used chia seeds before but this breakfast cake sounds great and a good start for me to try them. Anything that can make me feel ok about eating cake for breakfast sounds great to me! This cake looks scrumptious! Cake for breakfast? I’m in ! Cake for breakfast, you are speaking my language girl. I have never seen a vegan cake so moist. Great job. I’ve never baked with vegan ingredients, mainly because I’m scared and have no idea how the end result would taste. Your recipe doesn’t call for anything funky, though, so I might just try it the next time we have company in town. this looks so good!!!! i would never have guessed that this was vegan. i don’t know if i’ve ever had chia seeds before but i definitely do want to try it sometime. this cake looks delicious and i’m sure tastes just as great! I agree Bobbie! I have really enjoyed broadening my ways lately. Thanks for the encouragement, I eat a lot of vegan meals, especially when I am not cooking for my husband; I feel so much better when I do to! I plan to do some more experimenting. I need to take a look at some of your recipes for ideas too. 🙂 ~C. These look incredible. I cook for 5 vegans, including 1 gluten-free, will try to adapt this to GF. I would love to know what you come up with for a GF version. I have been doing a little experimenting with GF baking but haven’t blogged about any of it because I don’t feel like I really have it down though. I’d love to make this GF though. Thanks for commenting! ~C. I just made this-it is awesome!!! I used white whole wheat flour (didn’t have pastry), chia seeds, mini dark chocolate chips instead of nuts and I drizzled honey over it when it came out of the oven. It is sooooo good!!! Thanks Kesha, I’m glad you liked it! I need to get me some chia seeds! This looks awesome. FYI-I just cut off and ate another square and the flavor has really developed even more with time 🙂 Thank you so much for sharing this!! I love seeing fun new Vegan recipes! this looks great! I understand your surprise in baking vegan…and liking it! My sis is vegan and she shared a recipe for a vegan chocolate tart with me and it was unbelievably good. This looks like a great one. I’m going to send her the link! Thanks for posting. Breakfast and cake! Two of my favorite words. And when you can put them together….even better! This looks fabulous Cassie. I’ve yet to try vegan baking because I’m afraid things would somehow be dry. But this cake looks really moist! So you’ve got me thinking about it….. : ) Hope you’re having a GREAT weekend! I love that this is vegan, it looks so moist and yummy. I’ve not actually tried baking a vegan dessert. This looks like a great one to start with. Hope you are having a great day. Love breakfast cakes, and yours looks so delicious! Oh how lovely!! I’ve never adventured into vegan baking, it always seemed intimidating. But with this looks so freakin’ tasty – it looks worth a go. Dang it, now I need bananas and carbs. I used to think anything vegan would have to be nasty but in the last few months I’ve figured out that this isn’t actually true at all. And I’ve never used or seen chia seeds but I’ve seen them mentioned a few times this week so I’ll have to see if I can get my hands on some! So glad you like it Erin! I buy chia seeds at Whole Foods, if you have one of those close to you, I would recommend it. I think that any grocery store that has a “health food” section would also have them. Hope you enjoy! Hi Cheri, I didn’t end up putting ginger into the final version of the cake, just forgot to take it out of the instructions. I just updated it. Thanks! Veganism is a small but growing movement. In many countries the number of vegan restaurants is increasing, and some of the top athletes in certain endurance sports – for instance, the Ironman triathlon and the ultramarathon – practise veganism, including raw veganism. :`”..